Good news! In spite of the recession, you business is booming and your staff is growing. Unfortunately, you realize that your office seems to have shrunk and no longer meets your size needs. You know what that means. It's time to relocate. Office moves are a big thing for any business, regardless of size. A poorly coordinated move can stop productivity dead in its tracks. The perfect office move requires a seamless transition between locations. To achieve that, you need a company that can get you moved efficiently and quickly. Moving On Up™ has accomplished efficient commercial relocations with minimal downtime for various government offices, corporate departments, agencies and small businesses. Simply request an estimate for your business and provide a preliminary estimate and we'll get you started. We realize that moving your business is not a simple task. While moving, your customers may not be able to access you. You need a commercial mover that understands that and gets the move done efficiently. You can rest assured that your business in in good hands with Moving On Up™. We understand that your business should never be unavailable ever to service your customers. When your work day ends, our job begins. Moving On Up™ offers same day local moves and full-service packing and unpacking at delivery. This allows your company the ability to relocate and never skip a beat. Moving On Up™ packs everything in durable packing materials and loads the truck room by room so you can get back to work the next business day. Your electronics and computers will also be organized by respective location, from your employees' cubicles to the break room to your corner office. We guarantee to perform above and beyond all expectations, giving you peace of mind and professional execution of your move. No matter what size your office move is, Moving On Up™ can handle it right the first time and every time. Check out our customer testimonials from previous business moves to see how we help you get where you need to be. We offer excellent prices for local business and reduced rates for recurring customers. We are constantly running seasonal promotions and mover coupons for commercial relocations. To find out what specials your office move may be eligible now, pick up the phone and dial 1-877-MOV-ONUP to speak to our friendly moving consultants now. If you require storage while moving your business we offer private storage which is far more secure and efficient then acquiring a public storage unit. All items on your inventory are marked and documented, then loaded together on a palette and thoroughly wrapped in shrink wrap to prevent loss. 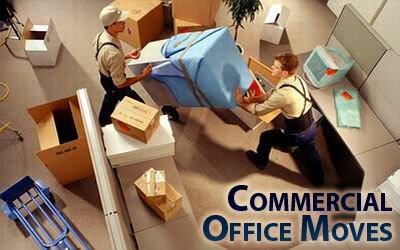 We help you accomplish that move preventing your business from any unnecessary loss of income. Your security is also protected inside our Private Storage facility, which has 24-hour surveillance. The only people that will have access to your sensitive information are our movers. You can rest safe knowing that your personal business information is secure. It is temperature controlled as well, which is essential for sensitive electronic equipment such as computers, printers and fax machines. When your office is ready to receive your stored items, simply contact your moving consultant and our professional team of movers will load your items directly from the palette to the moving truck and on to your office.